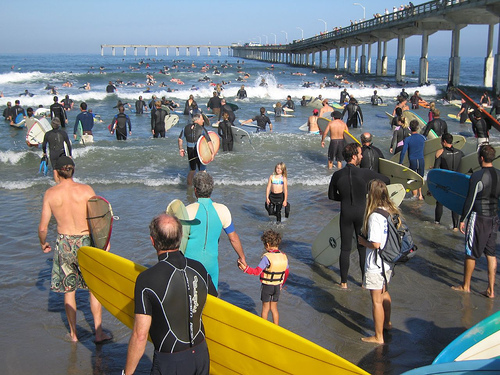 The Surfrider Foundation – San Diego Chapter is once again sponsoring their annual paddle at the Ocean Beach Pier for clean water. And this year is their 21st paddle. They urge surfers, beachgoers and others who support a cleaner coastline to participate in the 21st Annual Paddle for Clean Water from 9 a.m. to noon on Sunday, September 16th at the Ocean Beach Pier. Participants are urged to bring a surfboard, kayak, body board or other human-powered craft to paddle around the pier as a show of solidarity for safeguarding the water quality of our coastline and watersheds. the paddle at 10 a.m.
For more information, go to Surfrider Foundation San Diego Chapter and the Paddle for Clean Water, check out the Facebook event or contact Haley Jain Haggerstone at (619) 929-5350.